6 Snacks You Cannot Miss at Hollywood Studios! Dive in to the 6 Snacks You Cannot Miss at Hollywood Studios! 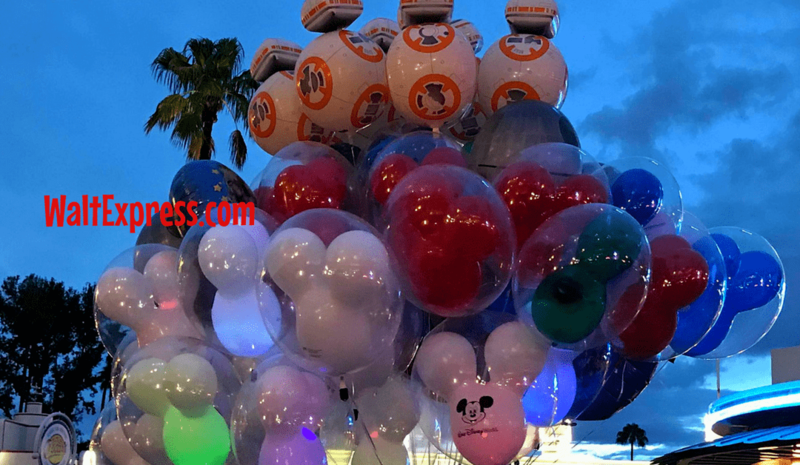 This post is full of the most scrumptious offerings at Hollywood Studios and several of them you can’t find anywhere else on property. Bring a napkin, because you are going to need it! 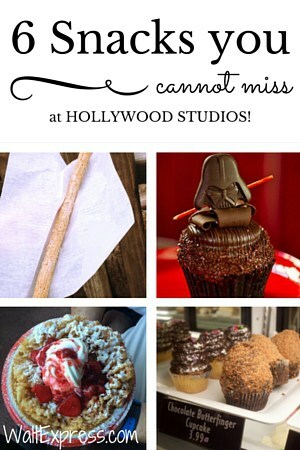 6 Snacks You Cannot Miss at Hollywood Studios! is here for your viewing pleasure. Hello my faithful snack-loving friends! The self-proclaimed Snack Queen is back to delve into even more mouth-watering morsels. This time, our focus will be on Hollywood Studios, where there is never a shortage of snacks to satisfy even the most persnickety palate. All of these snacks qualify as a snack credit. That is a real steal because this list if full of some really gigantic snacks. So, let’s not waste anymore time and let’s head straight down Hollywood Boulevard to a snack cart for our first item on the list. Churros are a soft, slightly sweet dough that is piped into a long, stick-like shape and deep-fried. 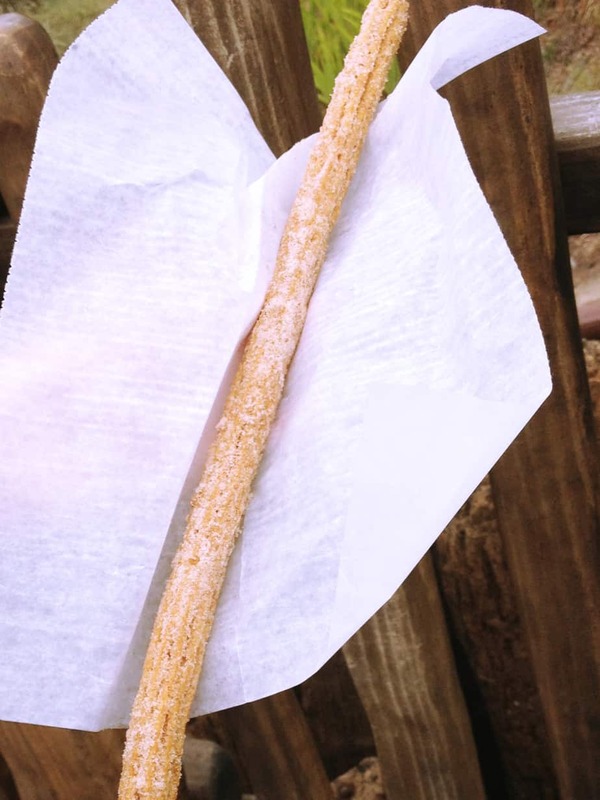 When the churro comes out of the fryer, it is rolled in a cinnamon sugar mixture and served in paper to keep the messy goodness from escaping. If you are lucky, you might time it just right and get one that is super fresh and that is when this snack becomes special. When they are fresh, they are slightly crunchy on the outside and soft and warm on the inside. Churros at Walt Disney World can be found at quite a few snack carts, but our favorite cart to get our cinnamon sugar fix is at The Great Movie Ride Pretzel Cart, which can be found close to…you guessed it, The Great Movie Ride on Hollywood Boulevard. 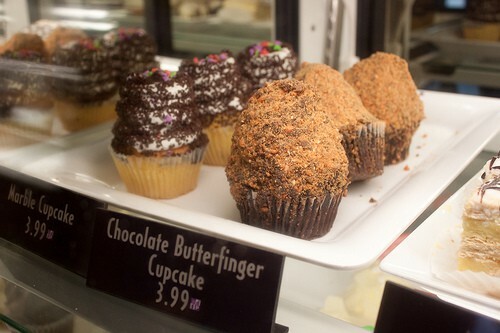 The Butterfinger cupcake tops a ton of snack lists around the web. It certainly earns that spot with its awesome blend of chocolate cake, vanilla frosting, and a chocolate coating. Of course all of this is topped off with what looks like an entire crushed Butterfinger candy bar. Just like the other cupcakes that you find at Walt Disney World, this thing is big enough to share and you can find it only at Starring Rolls. If you love candy, this is the cupcake for you! The Oasis Canteen is located next to the Indiana Jones Stunt Spectacular. It only offers a few items but it plays hosts to one of the best dining plan snack values in all of Walt Disney World. 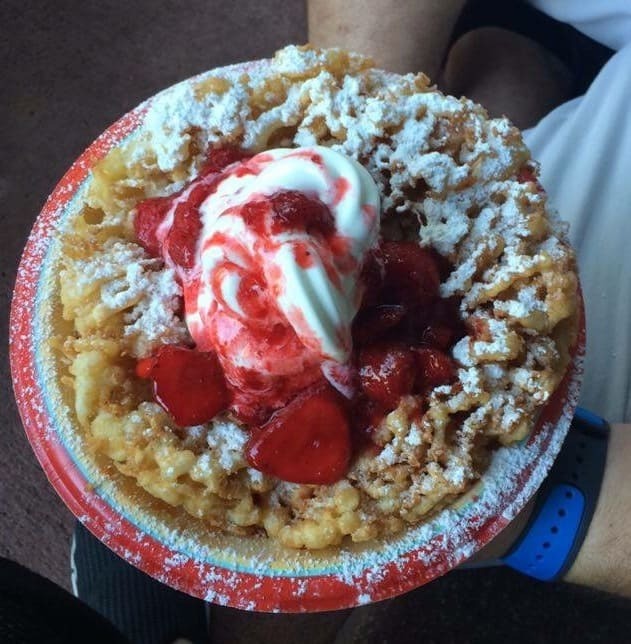 For $8.19 or one snack credit, you can purchase a fresh funnel cake with soft serve vanilla ice cream and strawberry topping! Now this is an incredible deal for one snack credit because this thing is so massive that it could easily be shared among a group of people. It’s a fairly standard funnel cake, but the toppings really make it a bit more unique and let’s face it…when one snack credit can get your family through an afternoon, that makes it a sweet deal. 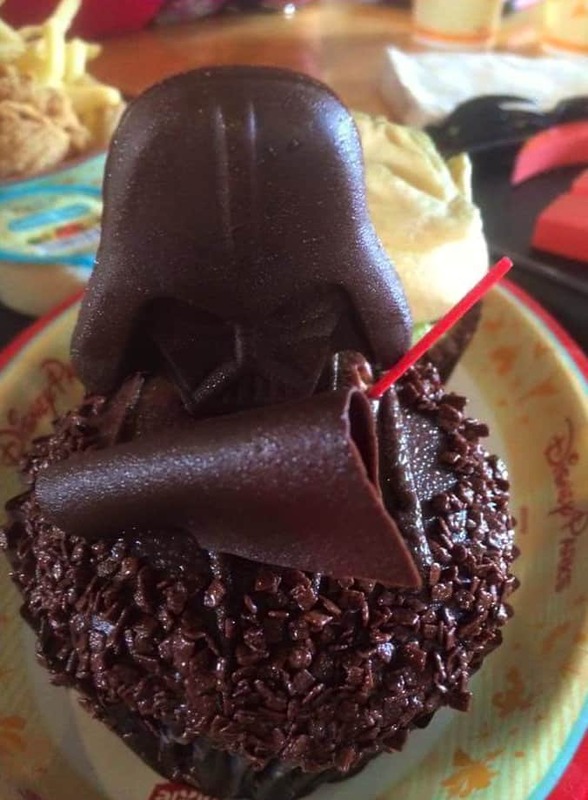 The Darth Vader cupcake has been around for a few years now, but could only be found during Star Wars Weekends. However, now that Star Wars Weekends are a thing of the past and the park is adding plenty of new Star Wars attractions and events throughout the year, it looks like this Dark Side treat might just strike back and hold a spot on several menus throughout the year. What makes this cupcake so special? Well, for one, it’s Star Wars themed, but quite honestly what isn’t these days with the new installment The Force Awakens release. Really what makes this cupcake a top pick is the combination of flavors. Who doesn’t love a moist, yet rich chocolate cake topped with smooth, creamy peanut butter frosting? To add to that perfect medley of flavors, they top this treat with even more chocolate; chocolate sprinkles, chocolate shavings, and a perfect chocolate mold of the one and only Darth Vader. Now if this cupcake doesn’t leave you thinking Darth is the mack daddy of cupcakes, well then I guess you better make room in your belly for #2 on the list…. Update on April 22, 2016: Writer’s Stop is no longer serving up these cookies, but you can now find them at Sweet Spells inside the Beverly Sunset store on Sunset Boulevard. In a little nook near the Sci-Fi Dinner is an unassuming book shop called Writer’s Stop. It’s a fantastic spot to grab an iced coffee and a treat and for a bookstore their bakery selections are quite nice. Even better, if you look closely at the menu you will find a few hidden gems that are served nowhere else on Walt Disney World property. One of those unique items is the carrot cake cookie. Now, you all know that my heart and my fluffy tummy are owed in part to my love for carbs and cream cheese and #2 has both in spades. 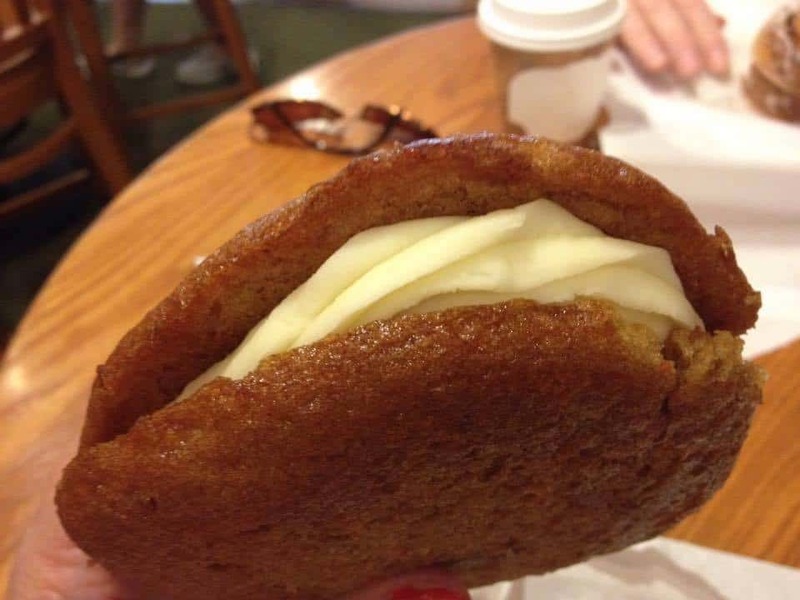 The carrot cake cookie is large, soft and crumbly and the cream cheese is heaped inside in generous amounts. The cream cheese in this cookie is more like frosting (super sweet), so if you are only a fan of the tangy cream cheese icing found on red velvet cakes then you might not appreciate this cookie quite as much as those of us who love sugar. My family likes to break this apart by sliding a plastic knife gently through the frosting and sharing it, because it is very sweet. If you love carrot cake, this snack will quickly skyrocket to the top of your list. Oh my stars, let’s talk some more about cream cheese!!! Starring Rolls is the home of the very first specialty cupcake I ever tried and I had no idea it would start an obsession. Thus I think it rather fitting that this cupcake makes the top of my favorite snacks at Hollywood Studios. 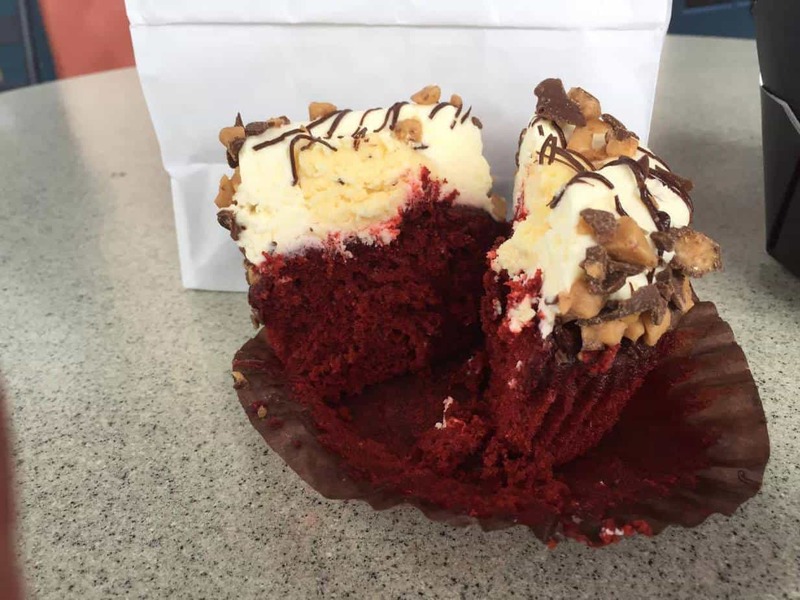 This confection combines so many of my favorite things; cupcakes, red velvet cake, and cheesecake. Oh and did I mention it has candy crumbles on top that I am almost certain are crushed Butterfinger? Lord have mercy, they are trying to make me gain weight just talking about this delicious cupcake. What I love most about this cupcake is that it is always moist and it is absolutely HUGE. I always share this and it still is almost too much food and even better, it counts as a snack credit. So use your credits wisely and grab one of these cupcakes and enjoy the moist red velvet cake with the cream cheese icing and large dollop of cheesecake in the middle of the icing. This thing is close to heaven for those of us who love red velvet cake. A few words of caution concerning this cupcake and any other options from Starring Rolls: 1) If cupcakes from Starring Rolls are on your list, make sure to stop by early in the day. They often close in the afternoon hours, which will leave a lot of people disappointed if they don’t plan accordingly. 2) Always give your cupcake a little time to thaw, because the display cases are refrigerated. Allowing 15-30 minutes for the cupcake to get to room temperature greatly enhances the flavors and texture of these sweet treats. Now that our Hollywood Studios list is complete, do you feel like these items are worthy of their own star on the Walk of Fame or should they be exiled to hostile lands? 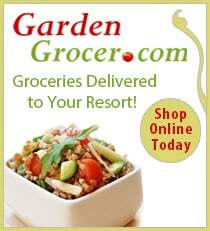 Please chime in and let us know what you think. 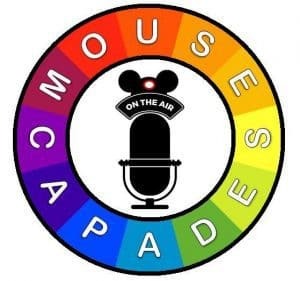 We can’t wait to hear what your favorites are because we will be using guest comments and our current lists to create our Grand Finale of Top 10 snacks in all of Walt Disney World post at the end of the series. 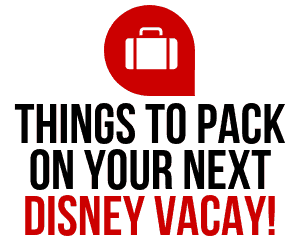 Stay tuned for the top snack list for Animal Kingdom coming soon to Walt Express. Until next time, I hope your days are filled with faith, trust and pixie dust. 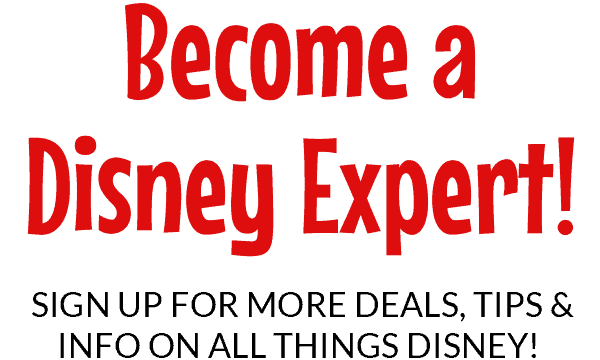 We would love to have you in our Facebook Group, DISNEY EXPRESS LANE!